Newly renovated four bedroom, four bath duplex with fully equipped kitchen. This four bedroom four bathroom duplex has been newly renovated and it has been designed with you in mind. When you come and stay, you will have a sense of comfort with all brand new furniture and you will feel at your home away from home. You will not have to worry about anything while you are sitting on the couch watching TV, or making dinner in the fully equiped kitchen, or just reading a book while laying in one of the comfortable beds. If you’re one of those people that like to be a little different and seek out a ‘real’ Medellin experience, but still want the same easy access to great bars, cafes and restaurants of the more touristy areas, this is the place for you! Envigado is still a virtually undiscovered gem, just a short cab ride from its more famous neighbor, Poblado where the majority of tourists stay. The apartment is within walking distance to almost everything you'll want to do while you're here and for the other locations, taxi's are easy to call and are metered so you don't have to worry about overpaying. 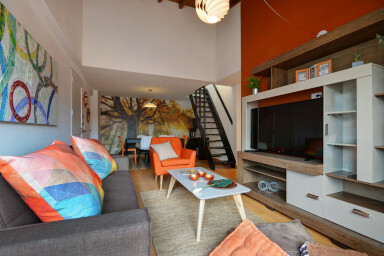 You are also close to the metro, and you can enjoy a short ride to Poblado.